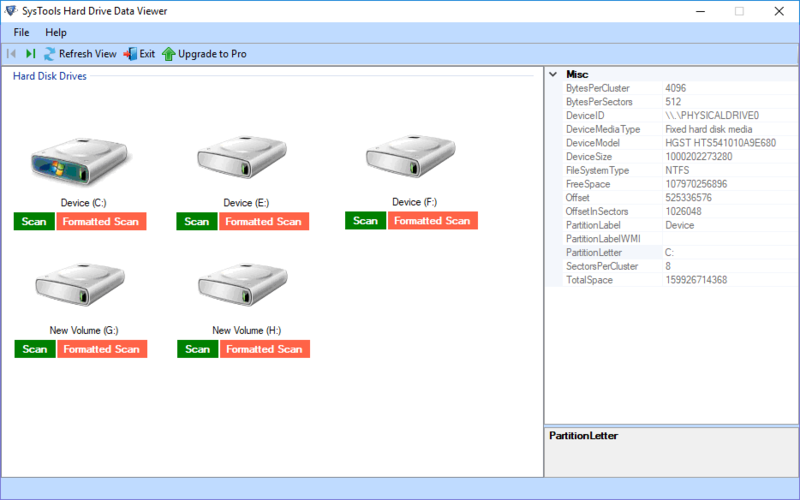 The Free Hard Drive Viewer software opens and explores corrupted / formatted external storage devices without any charges. The Hard Drive Explorer tool automatically detects for internal as well as external data with all files and folders. 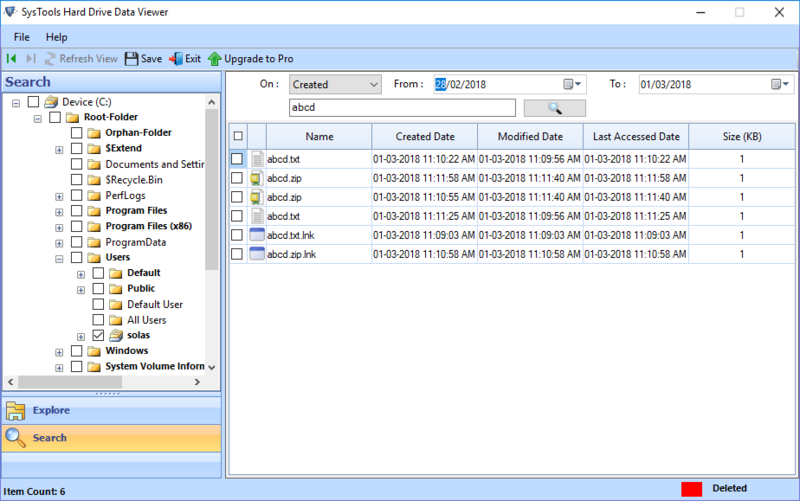 The Hard Drive Data Viewer Tool supports all versions Microsoft Windows OS like Windows 10, Windows 8, Windows 7,Windows XP, Windows Vista, and all lower editions. Full supports to external storage devices like USB drive, SSD card, etc. The free hard drive explorer is having capability of extracting data from hard drive and loading them on the software screen. 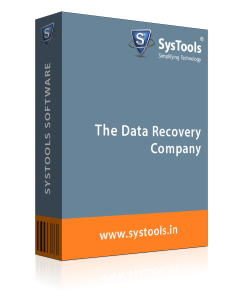 It retrieve Raw Data (ZIP,JPEG, GIF, PDF, MPEG LAYER – III, PNG, DOCX, PPTX, XLSX, WAV, AVI, BMP) from Formatted Drives. The tool lists all things in a way that are easily understandable by the end user. Hard drive viewer is totally a standalone solution to regain back files from formatted hard disks. The free hard drive file explorer application is capable to extract data from hard drives, which are NTFS formatted. All the items that get extracted from formatted partitions get loaded on the viewing panel. 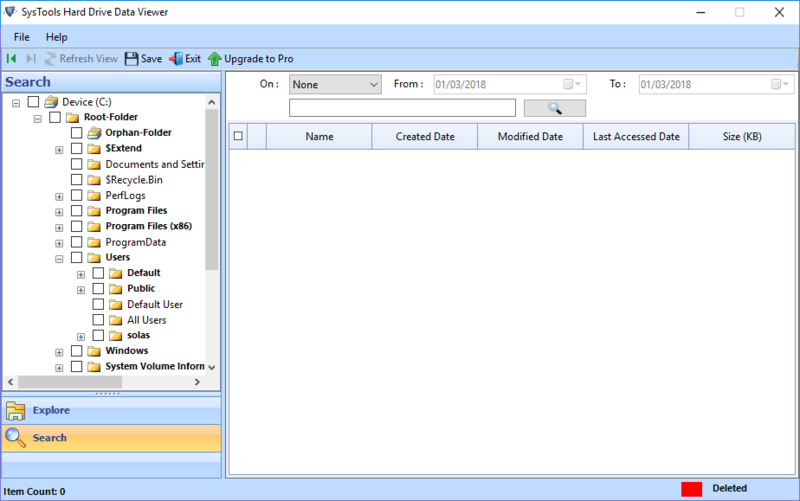 The free Hard drive reader tool comprises of ability to retrieve or extract deleted and lost partitions or files that are absent in the hard drive. Algorithms programmed in the software enables users to view deleted files from hard disk drive. The regained deleted items are highlighted in red color to distinguish them from existing files. 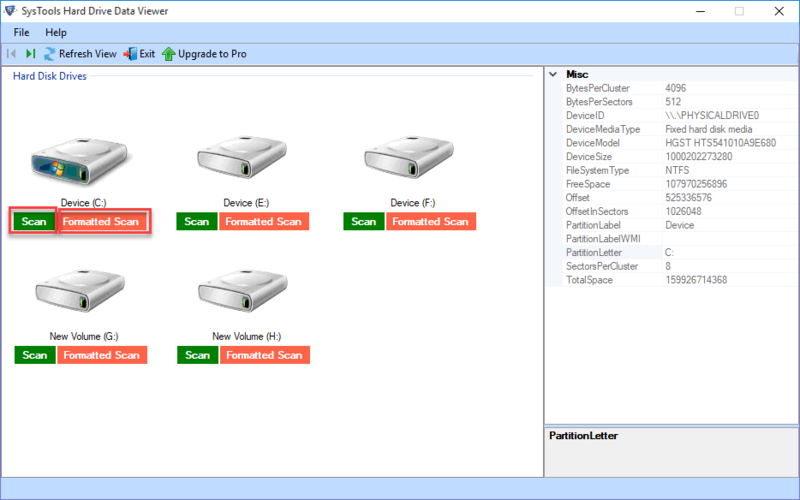 The Hard Drive Data viewer is intelligent enough to detect or find hard disk partitions and to view hard drive partitions from the system. Each hard drive with its associated attributes will get displayed on this screen. Just after launching the software, users will find all the drivers that are installed on their machine. The external hard drive explorer or opener freeware tool restores the files from internal and external storage devices. External storage devices like USB drive, SSD (Solid State Drive), SD card, portable hard drive, etc., will be detected and supported by the software. No matter what is the size of device, the software read data from a hard disk drive file of any size in Windows OS. Hard drive data reader permits customers to explore table of MBR and GPT partition on MS Windows 10, 8.1, 8, 7 and all the prior versions. Whenever an individual faces issue in accessing Windows partition, he / she can opt for this tool to fix it. Step 6 : Also view data files that are deleted. Deleted files will be marked in Red color. Q. Can I read formatted data of Pen Drive via Hard Disk drive Reader software? 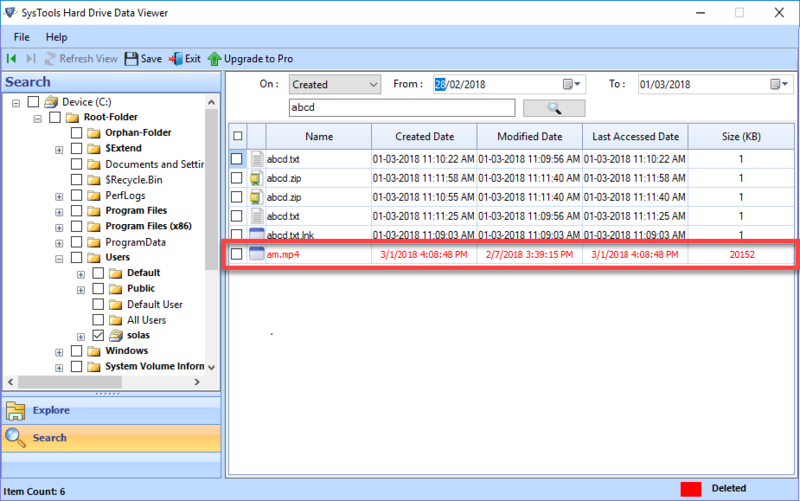 Ans: Yes, this Hard Drive Data Viewer tool works to view the formatted data. Using this freeware software, you will definitely be able to read formatted data of pen drive. Q. Can I search for some particular files by its demo version? Ans: Well, there is no such data search option in its demo version. You can upgrade this Hard Drive Reader software by purchasing it for using ‘Search Hard Disk Files’ option. After that, you will be able to filter data files by their size, date and name of the hard disk data. Q. Would this tool be able to save data files, which it have extracted during the entire procedure? Ans: No, the free hard drive explorer software only list downs the extracted files. If you want to save the file on local machine then, you need to upgrade it to its pro version. Q. Will Hard Drive Reader tool give support to view permanently deleted hard drive data? Ans: Yes, this Hard Drive Data Viewer application can show you the all the permanently deleted data items of hard drive. If you just need to view or open hard drive data file and folder names then, you can perform this operation via this utility. There are no charges for this functionality in the software. Note: Hard Drive Data Viewer Software will get delivered on your registered email id, within few minutes after placing the order. I have lost some data files from hard drive due to virus infection. I was so tensed because that lost data was very important for my business. Meanwhile, a friend of mine suggested me this Hard Drive Viewer software to open and read corrupted or damaged hard drive files. This Hard Drive Data Viewer tool efficiently scanned lost data and listed them all without losing a single bit of information. I am very thankful to the development team to invent such a useful application. The attractive thing for me about Hard Drive Data Reader software is its simple graphical interface. Each and every module of this Hard Drive Explorer software is easy to understand. There no high level technical knowledge required to work with this free tool and a novice user can also work with it easily. It is a highly efficient solution for a user like me. The team of developers did a great work. Hats off to the efforts done for creating such a best utility. Its an amazing application to open formatted pen drive files. 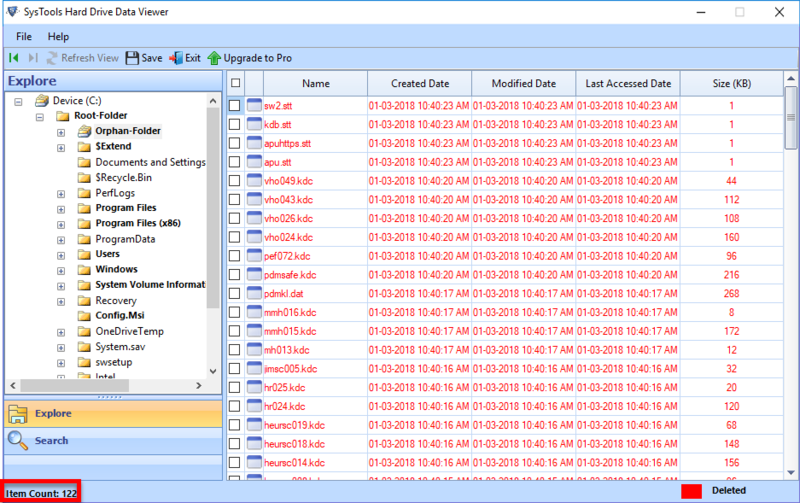 This Hard Drive Data Viewer freeware maintains the integrity of data while viewing the pen drive files. I am thankful to the developer team for creating this type of useful free utility to view formatted data files. The Hard Drive File Explorer software provides working in a simple and user-friendly way. Therefore, any user who does not have more knowledge of technology can use this tool to open formatted data files of pen drive.